Will Police Chief Sam Dotson Blow Up Laundry Every Day? The first sign it was not going to be a normal Monday was when I noticed a police officer wrapping part of Washington Square Park with yellow caution/crime scene tape. That’s the park area between St. Louis City Hall and shuttered Municipal Courts Building. When I say wrapping, I mean a half-assed wrapping job, similar to when your brother buys your birthday gift at a gas station on the way to the party. The yellow tape was wrapped around only half the park area. It was not secured to the trash can by Pierre Laclede’s statue. It blew off the can and danced in the wind. Its purpose was obviously not to keep people out. Police officers chatted in the park. Some workers sat on benches mere feet from the tape and smoked cigarettes. If it was a crime scene, no one was working it. There was a rumor that the white truck on the grass was a suspicious vehicle. We were told to evacuate City Hall. We did not get far, not even to the corner wiener cart, before we were summoned back into the building. A little later we were told that workers and customers on the west side of City Hall needed to move to the Rotunda. There was a rumor about a suspicious package on the grounds. Bomb Threat!!!!!!! Then it became suspicious packages, plural. Oddly, no one in the building seemed alarmed. There was talk it was a drill. The whole thing had a poorly written script feeling to it. Then it got weird. City Hall was on lock down. No one could exit or enter. Customers were desperate to leave but told they could not. It made no sense. Why couldn’t people leave from the Tucker/12th Street side of City Hall? As the locations of the suspicious items became known, most of us knew we had been had. The suspicious items were not bombs. The suspicious items were not suspicious. They were clothing and possessions of homeless persons who leave items around the shrubs and nooks of public buildings in Downtown. Their possessions include electric razors, toaster ovens, radios, etc., which they use by tapping into electrical outlets around public buildings and in public spaces. It is common knowledge. Until March of this year, the main place for such storage was the shrubs around Soldiers Memorial. But it has been fenced off for renovation. Homeless persons have since been using shrubs around Municipal Courts Building and City Hall for storage. It is common knowledge. But, it turns out, Police Chief Sam Dotson does not know about such things. Today was a sad day in St. Louis disaster preparedness history. The Police Chief called out the bomb squad to blow up someone’s laundry. But, first, the bomb robot had to put on an embarrassing show. Then it was all over. But it wasn’t. Someone forgot to call the police at City Hall and tell them we could leave. Perfect. Just perfect. So we waited some more. Had to. We were Chief Dotson’s prisoners. We were finally released at 12:10 pm. The police vehicles blocking traffic at Market and Tucker, however, remained another ten minutes because no one had yet told them it was all over. Now, I know we are all supposed to be on high alert because of the incidents in New York and New Jersey over the weekend. But the St. Louis City Police Chief called out the bomb squad for items left in areas where they are usually left every single day, low traffic areas, a grassy knoll by a parking lot. Chief Dotson held customers prisoner at City Hall in order to blow up the possessions of someone who had nothing else. That ranks right up there with 7th Ward Alderman Jack Coatar wanting to criminalize the feeding of homeless persons. I hope Chief Dotson has learned a lesson here. If not, there is, unfortunately, plenty of laundry hidden around shrubs Downtown for him to blow up every day. Rex Sinquefield is loading up the Spring ballots with charter amendments. This is the third initiative petition- with paid signature collectors- in a row. 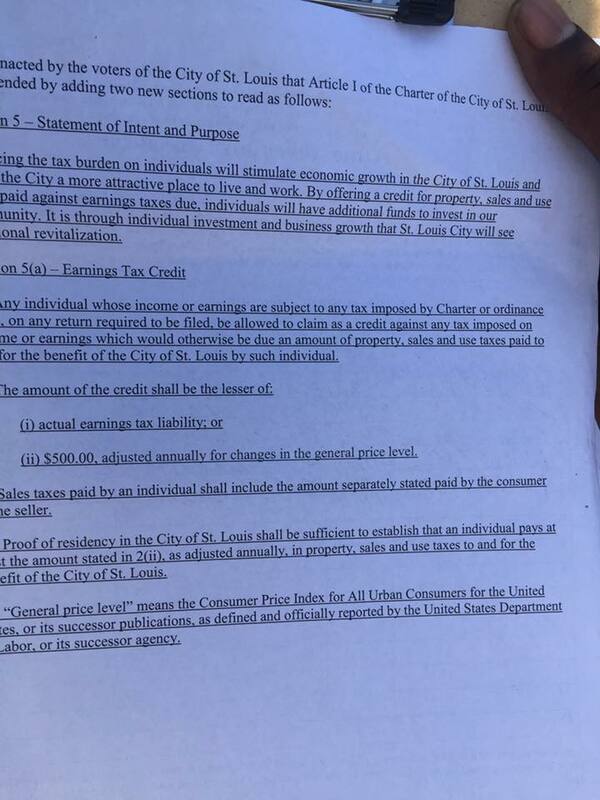 In addition to the Police Body Cam Scam amendment and the Low Turnout on Local Ballot Issues & School Board Elections amendment, his operatives are now working on the Bankrupt St. Louis amendment, a proposal to provide tax credits for payment of earnings taxes and exempting anyone making under $50,000 from the earnings tax. I recognize one of the sponsoring petitioners on this petition- Larry Stendebach. He is the tech guru for Pelopidas, the PR/lobbying firm making a mint off of Sinquefield. Great St. Louis is entirely funded by Rex Sinquefield, from his personal check and closing out the account of his Vote No on the E-Tax PAC, same address as Great St. Louis. Most of the Great St. Louis money has gone to the losing Primary campaigns of Republican candidates for Governor and Attorney General, Catherine Hanaway and Kurt Schaefer. Closer to home, on August 18th, Stendebach and Martin Casas filed papers with the Missouri Ethics Commission to create yet another Rex PAC- STL Votes!- to support an unnamed ballot issue. Casas manages social media for Better Together, another Rex Sinquefield project. Casas is also one of the sponsoring petitioners for Rex’s initiative to reduce turnout on local ballot issues and school board elections. I would imagine the new PAC is for that. 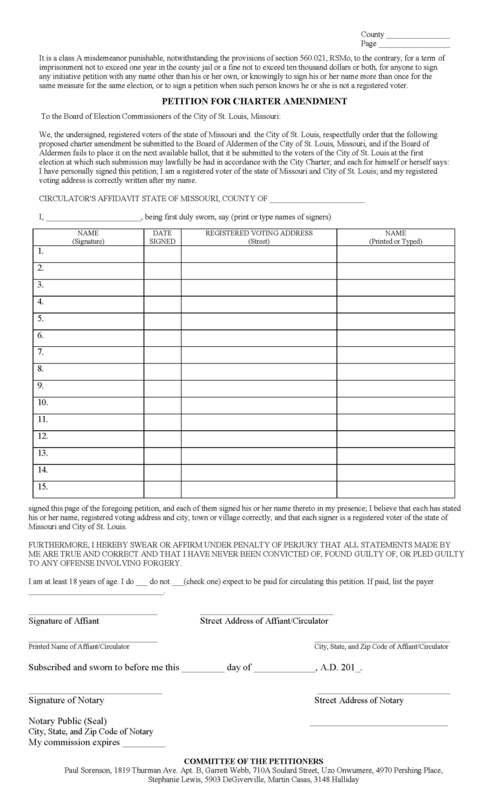 So, when a signature gatherer tells you that the Bankrupt St. Louis petition has nothing to do with Rex Sinquefield, feel free to take up some of his or her time and provide the facts. It appears the signature gatherers started Friday at the 78th District Re-Vote polling places and then hit the many special events this weekend around the City. St. Louis City voters just reauthorized the earnings tax last Spring with 72% of the vote. Here’s the process for these City charter amendment initiative petitions. 1) Upon acquiring sufficient signatures plus some, petitions are delivered to Board of Elections. 3) Board of Elections notifies Board of Aldermen that an initiative petition is ready for ballot. 5) Board of Elections places issue on ballot. 6) Charter Amendment passes if it gets 60% of the vote. This is no way to have a serious discussion about the earnings tax and how to replace the earnings tax. This is a punitive measure by Rex Sinquefield. His operatives are throwing everything at the wall in hopes something sticks. He has unlimited resources to pay signature gatherers a consultants. The initiative petition process was never intended to be a means for the wealthy to buy their way on to the ballot. It was never intended to be a business. I am a huge fan of changing local election dates for St. Louis City to state and federal election dates. It would, I believe, increase turnout for local elections and significantly reduce the budget for the Board of Elections. 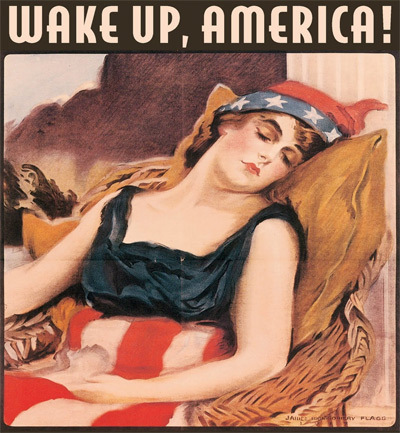 I have been advocating election date changes for about fifteen years. Most recently, I blogged about this reform idea in January 2015. In the 2015 7th Ward alderman election, candidate Chelsea Merta had pledged to work on this from both the Board of Aldermen and State Legislature angles. More on the latter in a moment. So you might think that I’d be thrilled when a petition came along to change St. Louis City elections from March & April to August & November. But I’m not. The devil is in the details. I was first approached to sign the petition outside City Hall. The signature gatherer told me it was to increase voter turnout by moving local elections to the Fall when state elections are held. I got excited. But, like many other voters, I am going to be very hesitant about signing petitions after the Rex Sinquefield and Senator Jamilah Nasheed Body Cam Scam Petition. Wanting to believe that someone had taken my idea and run with it with the best of intentions, I glanced over the petition, picked up the pen to sign, but then saw two names as sponsoring petitioners at the bottom of the first page: Stephanie Lewis and Martin Casas. Stephanie Lewis was spokesperson for Rex Sinqefield’s No on E Tax campaign. Martin Casas handles social media for Rex Sinquefield’s Better Together. So, I did not sign. I spent a number of days trying to get a screen shot of the petition’s three pages, so I could study it to find the horrible parts. Then I contacted Garrett Webb asking for a copy. Mr. Webb is a political consultant and also one of the sponsoring petitioners. He obliged and emailed the petition to me. The three pages are posted at the end. Then I set up a meeting with Mr. Webb to discuss the problems I found, and there are huge ones. 7th Ward Committeeman Marty Murray, Jr. and me met with Mr. Webb last week to go over concerns. It was a friendly talk. I think some of the consequences were genuinely new issues for him. One of the problems with initiative petitions is that the ballot issues are vetted by Board of Aldermen but no changes can be made. If this had originated in the Board, consequences would likely have come to light, changes made. Here are the Issues: The petition if enacted would result in extra super low turnout for School Board, Community College District Trustee, and ballot issues because there would be no citywide or ward contests to draw voters out. The petition only moves municipal officers and aldermen from March and April to August and November without addressing other elections. Rex Sinquefield could and would run the table with charter amendments- including getting rid of the earnings tax- under 2% turnout scenarios. He could elect his own anti-public education School Board Slate. None of the seven signature gatherers that I spoke with over the past weeks said anything about this petition reducing the cost of elections. That’s because it’s not intended to reduce the number of elections. It’s intended to reduce turnout in elections important to Rex Sinquefield. First, the Board of Aldermen and next Mayor should lobby the Missouri General Assembly to change our School Board and Community College District Trustee elections to state elections. Without the Legislature’s assent on this matter, moving election dates for other elected officials is putting the cart before the horse. Second, if successful with the Legislature, the Board of Aldermen should then send voters a charter amendment requiring local ballot issues- referendum or initiative- go to voters during state elections. There needs to be some option for real emergency referendums, perhaps some extra super majority of aldermen consenting or unanimous vote by Estimate and Apportionment, but the language needs to be tight. Many of us are familiar with how emergency clauses work on legislation today, which is everything fits the definition of an emergency. Because of it, the right of the people to petition to undo legislation by public vote is just nice words in the City Charter. 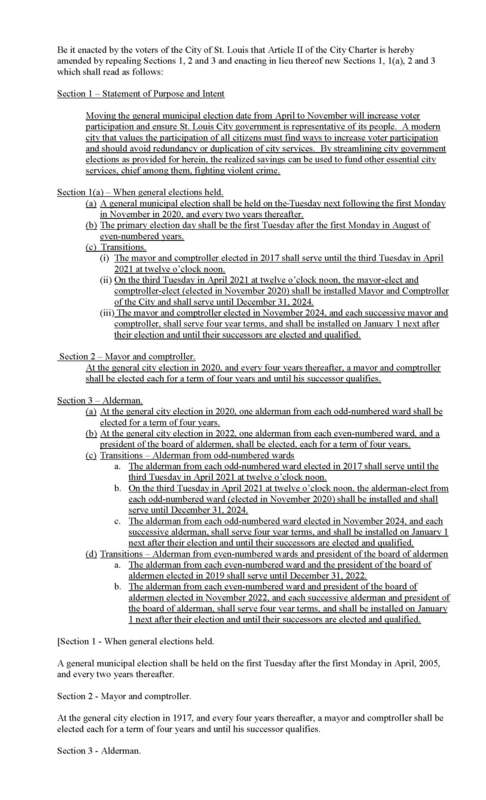 Third, if voters pass the local ballot issues election date charter amendment, the Board of Aldermen should send voters an amendment moving the mayor, comptroller, board president, and aldermen elections to state elections. There needs to be a provision for special elections to fill vacancies, of course. And, I’d also like to see a sunset on the local officials election change- twenty or so years. We would evaluate how it worked and either vote to renew it or go back to the old election dates. I’d like to see it with a sunset clause so that the decision to have it back on the ballot is not left to aldermen or initiative petition. Which brings me to the argument against moving local elections or local ballot issues to state elections- people are weary of long ballots. My answer to that is we can declutter the ballot by making it more difficult for people with big money- like Rex Sinquefield- to purchase ballot space via initiative petition.